This has to be one of the premier places in the WORLD for a teambuilding scavenger hunt. Let’s just start with the restaurants! Fantastic pasta…delectable Chinese food…and that’s just the beginning. You’ll also see ancient temples, historical plaques discussing the history of the City (Chinatown is where it all began…it’s where they announced the discovery of Gold in 1848!). Walking here is like taking a plane to Europe, making a stop over and then continuing on to Shanghai. It’s just the perfect place to explore with a teambuilding scavenger hunt. Venue Description: Your Dr. Clue corporate teambuilding exercise in North Beach/Chinatown moves from the exotic streets of Hong Kong (or so it seems) to the boulevards of Rome or Florence. It’s like 2 countries in one! 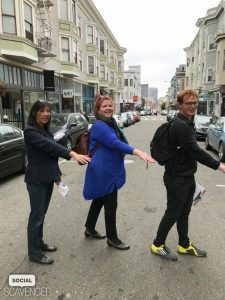 During your corporate teambuilding treasure hunt… you may run into: a church where Marilyn Monroe got married; a fortune cookie festival; the most Beat Generation bookstore in the world; the best view in the city from atop a parking lot, and much, much more.